Sweet Floweret: Oh Rotten Bananas, How Do I Love Thee? Oh Rotten Bananas, How Do I Love Thee? Almost every week, I buy bananas and no one eats them. Maybe one or two get eaten, but the rest turn brown and smell up the kitchen. And I shrug and say, "guess I'm making banana bread!" I LOVE banana bread. For years I searched to find the perfect recipe. I like all kinds but wanted a recipe where the bread was super moist. And by jove, I found it. Whenever I make this for someone, they ask for the recipe. The addition of chocolate chips made my husbands Bible study group my bff's (for a few minutes). I know. These aren't "bad" but the kids won't eat them with brown spots! 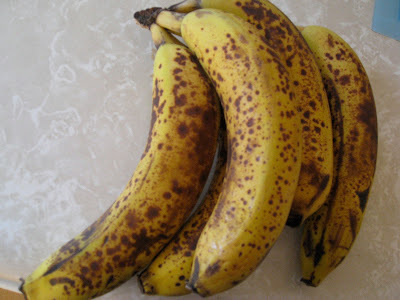 Never thought I'd post pics of brown bananas on the blog! It makes TWO loaves. Here you go. Top secret. Mix the flour, salt and baking soda into a large bowl. In a separate bowl, blend together the butter or margarine and sugar until smooth. Blend in the bananas, eggs, and chocolate chips/walnuts until well blended. Pour the dry ingredients into the wet ingredients and mix just until blended. Divide the batter evenly between the two loaf pans. The bread gets really dark brown in the oven. The first time I made it I thought I was burning it because I was used to a lighter "crust". 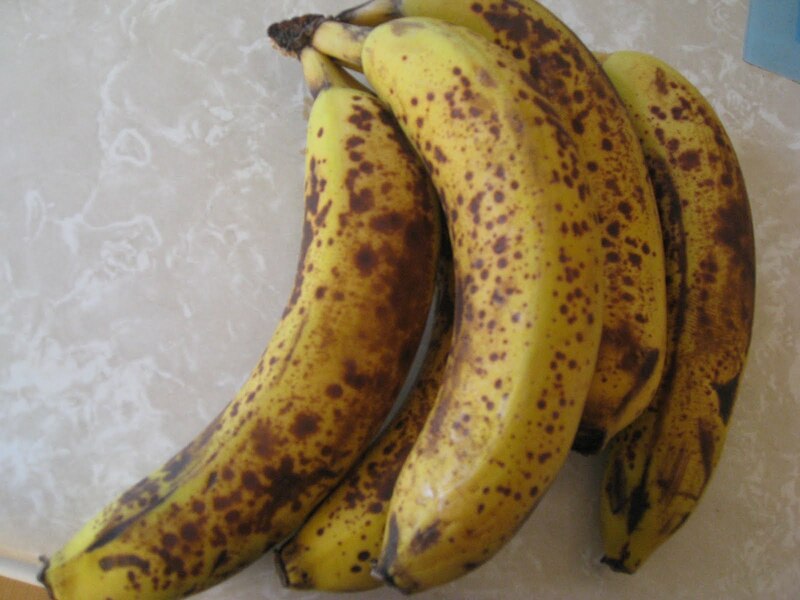 If you have bananas going bad and don't have time to make banana bread, just peel those bananas and stick them in a freezer bag in the freezer. When you're ready to make your bread, defrost the bananas and use em'. There will be a lot of "juice" in the bag from the sugars in the bananas. I found that my banana bread turns out even better using these. This bread tastes best refrigerated. Nutella on top of banana bread is tdf (to die for). If you don't need two loaves of bread, freeze one. They defrost well and still taste great. There you have it! If you try this recipe, let me know what you think. You can also leave the bananas in their skins when you freeze them, then defrost when ready to use, cut off the top and squeeze the banana out (like getting all the toothpaste out of the tube). This is a little yucky, but if you have boys helping they think it's fantastic! Chocolate chips in banana bread are the best. Sometimes I hold back about 1/4 the batter, stir in a quarter cup of cocoa, and then drop by spoonfuls into the batter in the pan. Marble a bit with a knife, and you've got chocolate marble banana bread. Sprinkle with sugar and cinnamon before baking for extra decadence. I love banana bread! Also, I was recently informed about "banana ice cream"... You take two bananas, freeze them, then blend them up with a food processor or a blender... And they magically take on the consistency of ice cream! You can then either add peanut butter to the banana in the blender, or top the plain banana ice cream with things like dark chocolate chips and walnuts. A very healthy alternative to ice cream! Step 4: Drive extra loaf to neighbor/BFF Rachael's house immediately after removing from oven. Note: this is an important step. Ohh...I want to try the banana ice cream idea! After receiving a loaf from you a few years back, I swear by this recipe. LOVE, love, LOVE the chocolate chips in it! The banana ice cream suggestion has reminded me to make some homemade, frozen chocolate covered bananas! yum yum! I'm gonna try that banana ice cream idea. It won't be so healthy after I add all the fixin's tho!